Expensive flaws persist in our collective, prevailing assumptions about change. We overwhelmingly view change as something for us to do to the organization, hence the popularity of the doubtful metaphor "managing change." 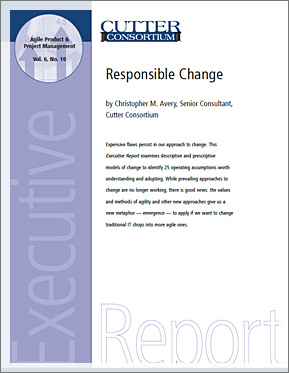 In this Executive Report, prepared for an East coast think-tank, I examine descriptive and prescriptive models of change from noted authorities in order to address three questions. I conclude the prevailing model of change "management" is broken, and provide an agile alternative based on the principles of The Leadership Gift™. Some readers have remarked it is one of the best commentaries on organizational change they have read. Are there reliable operating assumptions about dealing with change, and, if so, what are they and how do you apply them? Are there fundamentally different approaches or philosophies for dealing with change, and, if so, how do you recognize and choose among them? What's worth paying attention to when attempting to change a traditional IT organization into an agile one? The report concludes with suggestions for applying the operating assumptions and lessons from agile (i.e., emergent) approaches to change in order to become a more agile IT organization. "We have studied The Responsibility Process™ over the past 3 years to help educate our entire organization on personal and shared responsibility. And we have experienced dramatic results." "Christopher, THANK-YOU!!! You have been a tremendous help!! One thing that I noticed after your visits Christopher..... It is like business goes into hyper speed!!! We get on stuff and make things happen! We get off STUCK quicker! I don't have enough time to type all of the wins! Thanks again!" "You were a hit! Without a question, we made the right choice in asking you to launch our national conference, and we look forward to working with you again. It's a pleasure to engage someone who 'walks his talk."